Hordes & Heroes Fantasy rule system is based on H&H Medieval with the addition of magic and special rules to reflect the particular fighting characteristics associated with particular fantasy armies. It is designed as a fast play tabletop wargame, which uses hexagon marked terrain as a precise and effective method for moving troops. The rule system is simple and easy to learn, yet sophisticated enough to allow “realistic“ battles to be fought between a diverse range of fantasy armies. It is easy to play, but more difficult to master. One A4 Quick Reference Sheet is sufficient to contain all the information necessary to play. 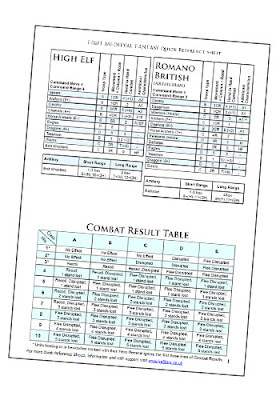 The Combat Results Tables can be printed or photocopied, cut and pasted together as required. There is a Quick Reference Sheet Generator on the website to enable players to quickly create and print the play sheet for a game between any fantasy armies contained in the army lists. The main rules need only be consulted when players are learning the rules, and occasionally thereafter, to clarify situations as they arise. The precision of the movement system and the speed and efficiency of the combat system ensure that the game flows quickly and even a closely fought contest between two armies of 150 points can be concluded within 1½ hours to 2 hours. This makes the system ideally suited for competitive and tournament play. The game is designed to be played on modular hex terrain which can accommodate a range of different terrain features, e.g. open ground, hills and slopes, rivers, woods, impenetrable terrain etc. 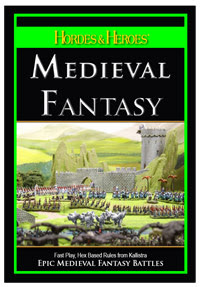 The HHM Fantasy Army Lists are designed to enable any medieval fantasy army to be represented on the table top, in a miniature game, up to an agreed point value. We have endeavored to make the lists as flexible as possible to enable historical armies to be used with the addition of fantasy elements, such as flying units and magicians. 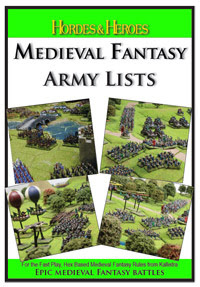 Hordes & Heroes Medieval Fantasy Army Lists currently contain 24 different armies which can be easily modified and adapted to your own specific preferences or requirements, for use in a particular game, or to form part of a fantasy campaign. One A4 Quick Reference Sheet is sufficient to contain all the information necessary to play Hordes & Heroes Medieval Fantasy. The main rules need only be consulted when players are learning the rules, and occasionally thereafter, to clarify situations as they arise. An example of a Quick Reference Sheet is shown above. 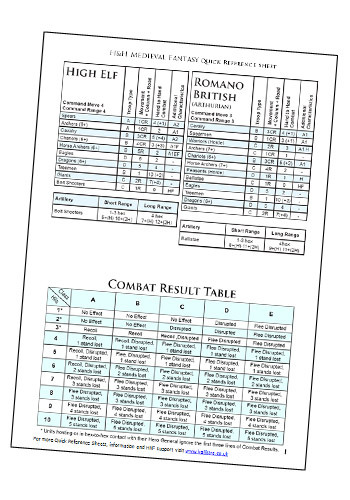 It's quick and easy to generate the required reference sheets for your Hordes & Heroes Medieval Fantasy Battle.